Taste test: This granola-like bar had kind of an odd consistency, with some denser areas and some air pockets. 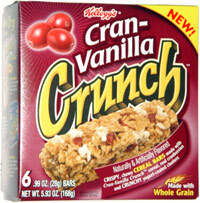 It consisted of a cereal base, plus cranberry pieces and vanilla yogurt pieces, held together by the sweetened cereal. The taste was kind of sweet but pretty good, with lots of vanilla and cranberry taste, but the uneven consistency made the eating experience somewhat challenging. 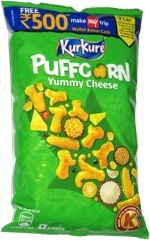 Still, this was far above average as cereal bars go, since most of them are dreadful.